Guy’s you’re coming down to the last minute on coming up with a creative mother’s day presents! Your palms have to be sweating! You need to come through in the clutch, and score that ultimate creative gift! One that looks like you spent weeks planning. Here are a few last minute gift ideas that might help you along with the other posts in this series. Groupon or Living Social – have you checked out either of these deal sites lately? They are offering a lot of Mother’s Day Deals, which might be a great last minute gift to save the day. 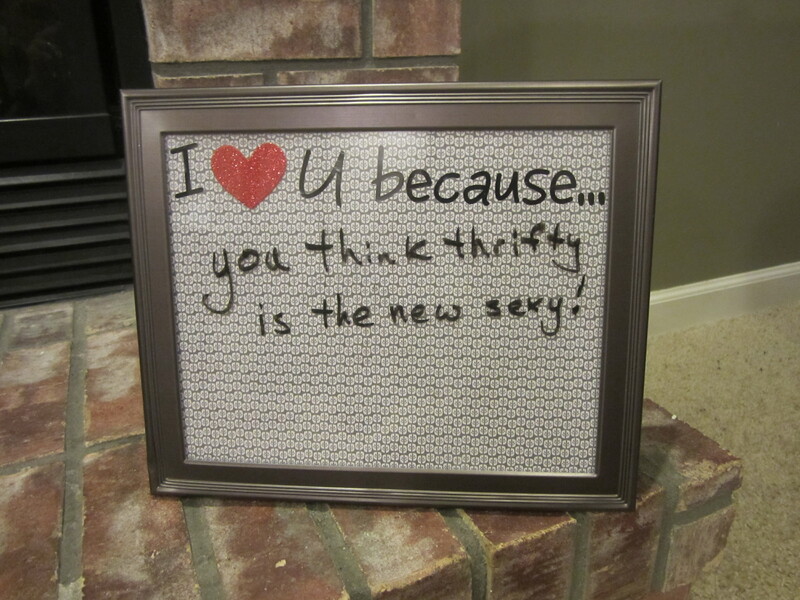 I Love You because… (Picture Frame) – this idea I stole from my wife, but any of you can use it for your mom or wife. For valentines my wife bought a nice frame and inserted some nice text (printed out) behind the frame. Then bought a dry erase marker and now we have a wonderful way to say “I love you because…” to each other. It’s something small, but will go a long way to say I value you this mother’s day. Classic Flowers – if you need a quick save then you can always rely on the classic bouquet of flowers! Breakfast in Bed – what mother’s doesn’t want breakfast in bed? Just to have one day where you don’t have to get up with the kids, make breakfast, get the kids ready for school, or wake up to the morning chaos? Can I get a collective AMEN from all the mother’s out there? Amazon’s Mother’s Day Sales – Amazon’s Mother’s Day Gifts sales offers a great assortment of motherly gifts. If you order today, then you can still do next day delivery to get it by Saturday afternoon. Have you got any more ideas? We are giving away a $20 Amazon gift card for the best idea! Last day to enter is Sunday. Mom, I don’t know if you’ll ever read this, but I wanted you to know this mother’s day how much I appreciated you. When I wrote about watching dad going through bankruptcy earlier this year I couldn’t help but think of how much you did to hold our family together! You have had the most servant heart I’ve ever seen in a mom, and you never ask anything in return. Even now as you’ve quit work in the last three months to take care of Grandpa you continue to display your selflessness. On top of all that I credit you, first and foremost, for making me the thrifty man I am today! From the countless times I saw you trading coupons with our neighbors or going into town to buy 45 boxes of pudding for just $2.45 or buying my school clothes at garage sales. All these memories are firmly impressed in my Thrifty Guy brain, and I have only you to thank for it! Thanks for being a great mom, and showing me how to make my dollars stretch! Happy Mother’s Day Mom! Love ya!